You can get a free Vivanno drink at participating Starbucks locations today July 25th and tomorrow July 26th. The catch is - you need to have a registered Starbucks card, which I do. I got the chocolate banana flavor, and it's pretty good. I also have a coupon for a free one and I might use it to try the fruity one with the addition of matcha tea powder. Starbucks Coffee Company is raising the bar on good nutrition with the introduction of Vivanno™ Nourishing Blends, which are available Tuesday, July 15 at Starbucks stores across the U.S. and Canada. Developed with a strong nutritional goal in mind, the Orange Mango Banana and Banana Chocolate flavored beverages provide at least one serving of fruit, 16 grams of protein, and 5 grams of fiber with 270 calories or less and no artificial colors, artificial sweeteners or high fructose corn syrup (nutrition based on 16 fluid ounces). 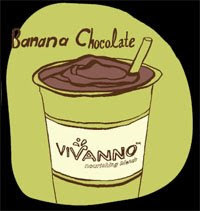 • A Shot of Espresso added to the Banana Chocolate Blend provides the bold, smooth flavor of espresso with no extra calories. • Matcha Green Tea Powder added to the Orange Mango Banana Blend gives the beverage the antioxidants of green tea with only 40 additional calories. The powder also increases the amount of Vitamin C to 45 percent Daily Value. • Nonfat Milk in place of the standard 2 percent milk shaves off 20 calories and up to 3 grams of fat. Neither of our 2 Starbucks (1 of them is closing) knew about the promotion but thank goodness for the registers that automatically took the price off. DH had 2 Vivanno's today and I had one. The Choco/Banana is a bit chalky but I had them only put 2 scoops of the protein powder in mine, instead of 3 and it was much better.